I make tomato jam several ways using variations on the New York Times recipe. I made the recipe as written once, but thought it was far too sweet. I use half the sugar, switched to brown sugar, and quite a bit more lime juice. I sometimes use cinnamon and red pepper flakes, sometimes I add a habanero, but the best, I think, is this one with Jamaica Jerk seasoning mix. It’s a deeper, more earthy flavor. Dump everything in a heavy medium saucepan and bring to a boil, stirring steadily. Bring the heat down to a simmer and let it cook down to jam consistency. This will take about an hour to an hour and a half depending on how juicy your tomatoes are. Check on it and give it a little stir about every 15 minutes so it cooks evenly and you don’t let it scorch. Taste about mid-way through and add seasoning to your taste. When it’s cooked down to a jam, let it cool and store it in the fridge. I will keep at the very least a week, more likely two weeks thanks to all the acid in the tomatoes and the limes. There’s nothing like a delicious sandwich for lunch. The trick is to get a good blend of flavor and texture and this sandwich brings everything. 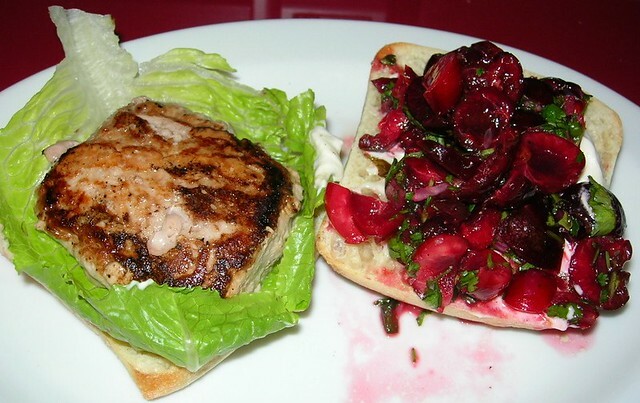 There are three ingredients in this sandwich, roast pork, cabbage, and chutney. I like to buy the cheapest pork roast, the shoulder or picnic roasts which run about $1.50 per pound. I spread Jamaica Jerk seasoning over the outside of the roast, top, bottom and sides. I roasted for about 40 minutes at 450° F. Roasting time depends on the size of the roast, so I always use a meat thermometer, removing the roast from the oven to rest when the thermometer reaches 140°. Chutneys are the easiest thing to make. All you do is toss some fruit in with sugar, spices, lots of ginger, and some vinegar or citrus juice, in this case, lime juice. Chop everything up, bring to a boil, reduce heat and let simmer for about one to two hours so all the substance is cooked down to a thick liquid. These are ingredients in this chutney. This makes about a cup of chutney. 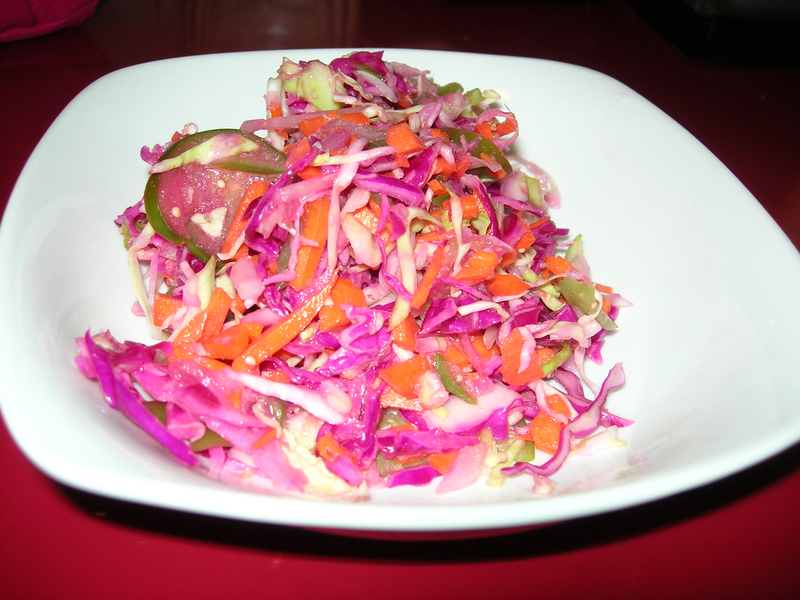 Just about any slaw will work, a mix of crunchy cabbage with a dressing of vinegar is all you need. I suppose you can use any bread, but I am partial to rye. I spread chutney on one slice and mayonnaise on the other. 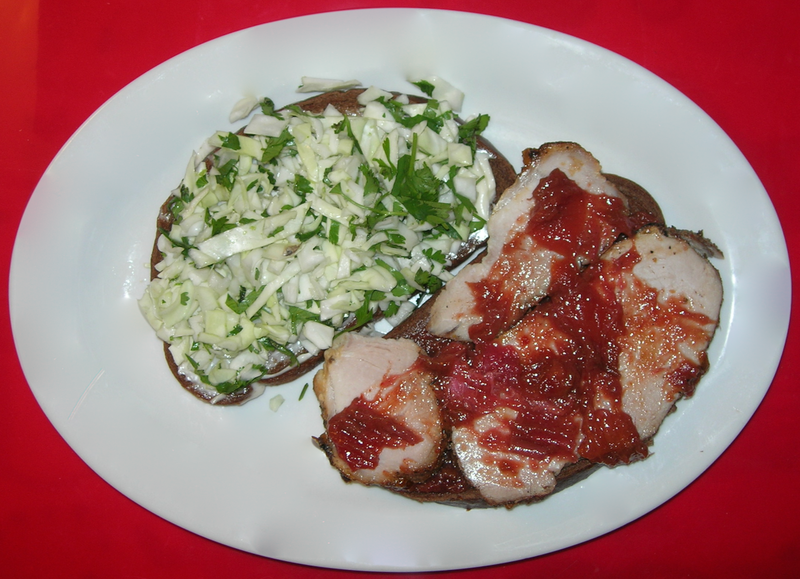 On the side with mayo, I put the cabbage slaw and I put the pork on the chutney side. I spread a bit more chutney over the pork. This helped hold it all together when I put the pieces together and cut it in half. This is a delicious sandwich with the crunchy freshness of the cabbage with the bit of tang of vinegar and lime. The chutney adds the unctuous sweet and sour. The rye lays down this hearty foundation for the meat and slaw. It’s perfection. The cabbage should be chopped first and left in a colander, salted to bring out the liquid so the slaw does not turn watery. Wring the cabbage out after it has sat for 30-45 minutes. Then add the carrots, onions, and tomatillos. Mix. Add dressing and shake to distribute dressing over the entire slaw. Do not serve for at least 30 minutes so the flavors begin to marry. This is a very light, fresh cole slaw. Despite the Sriracha and the ginger, it is not that hot. It just has a bit of zing. The tomatillos add a tartness that is fabulous and there is the layer of lime that is right there, adding that citrusy note but it not bitter. 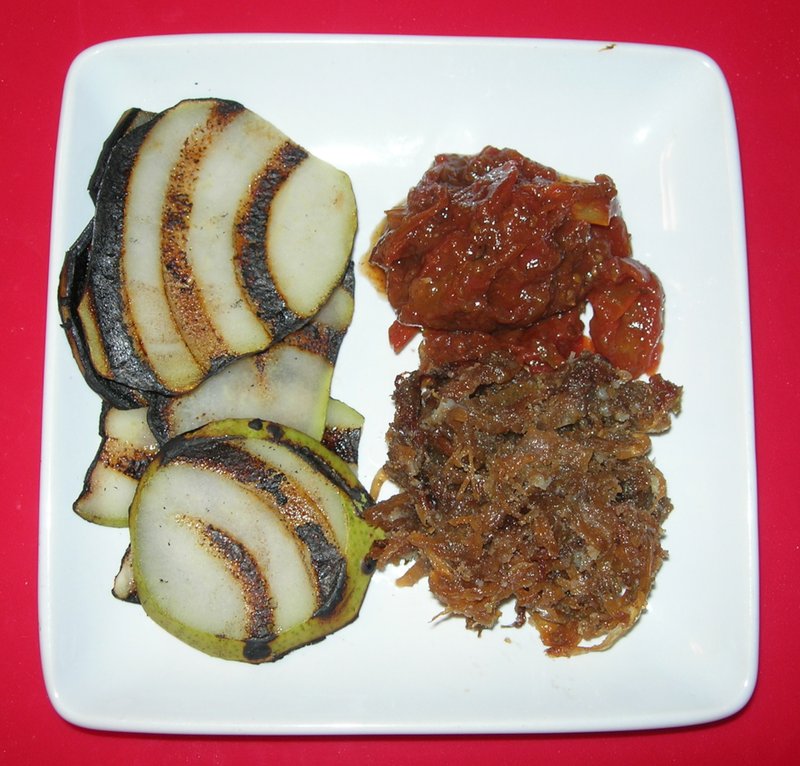 I chopped everything very small to make it work well on sandwiches or even dropped into a bowl of chili or soup. There is just enough dressing to coat the veggies and soak in a bit, but not enough to leave a layer of liquid in the bottom of the bowl, so it does not saturate the bread and when you sauté it with some pasta or rice, it does not add a lot of oil. This is a big batch. It made 4 quarts of cole slaw and I gave half to my best friend who went with me to Harvest Share. However, the thing with cole slaw that does not have a creamy dressing, that has no buttermilk, yogurt, mayo, or sour cream, is that it will last for several days…which means it is there for several meals and there is nothing more versatile. Eat cole slaw on its own. Use cole slaw on a sandwich. instead of lettuce. It’s delicious wth some pulled pork and chili beans on a burrito. Sauté lightly with some pierogies or pasta. This was another easy to prepare and flavorful salad I made ahead for some company coming over for brunch. In the morning, I added 1 cup of boiling water to 2/3 cup of bulgur in a one quart plastic bowl with a lid. I sealed the lid and left for later. In a few minutes the wheat absorbed all the water and it was ready. I stuck it in the fridge for later when I would mix up the salad. I drained a 15 oz can of black beans, rinsing all the liquid off and let them drain in a strainer while I chopped up the veggies. I chopped 3 green onions, 1/2 of a red pepper and a bunch of cilantro. I also quartered 8 cherry tomatoes. 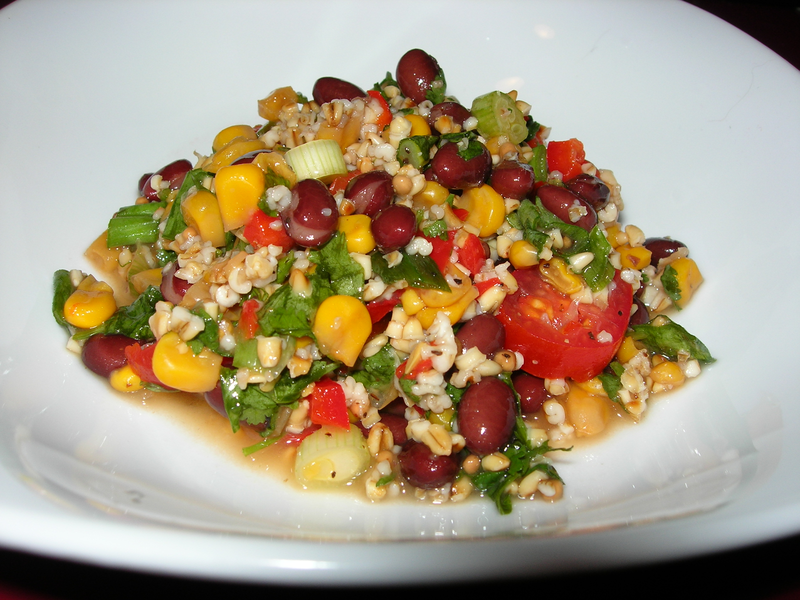 I mixed them all in with the bulgur, added the beans and 1 cup of corn salsa. I squeeze 2 fresh limes, added a dash of salt and pepper and 1/2 tsp of cumin and it was ready for prime time. It’s a flavor fiesta – spicy, sweet, crunchy and toothsome. The corn salsa adds just the right amount of heat. This made one quart of salad – all in the original container – so it also meant very little cleanup – a strainer and a knife. This is just a recipe for the Wild Plum Sauce. 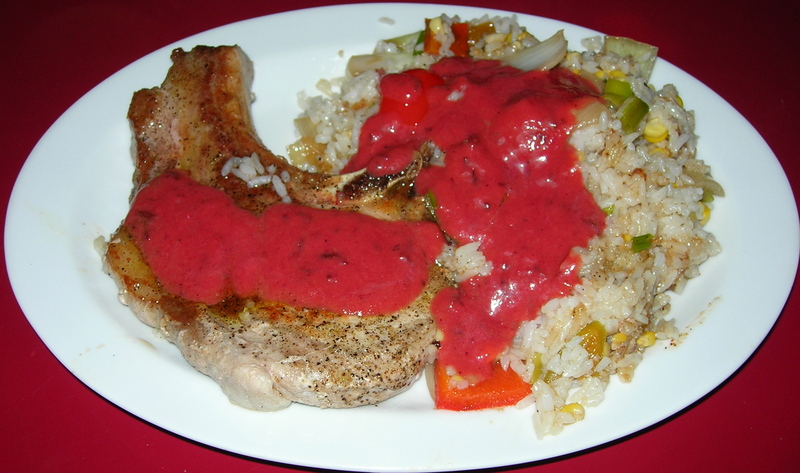 My best friend made the stir fry that I served over the rice with the sauce and a pork chop. She brought over 2 quarts of wild plums and suggested I come up with a good sauce. I love a challenge and started to work. I put 1 TBSP of olive oil in a sauce pan and heated to medium. I chopped on medium yellow onion and sautéed them with 2 inches of minced ginger and about 1/4 to 1/2 tsp of grated nutmeg. I let the onions cook until tender. Meanwhile I removed the pits from the plums. 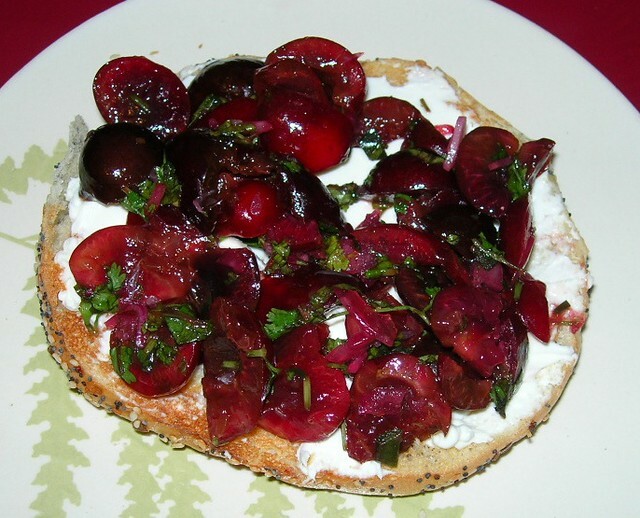 When the onions were tender, I added the plums and 1/4 cup of white vinegar. I let simmer until the plums broke down into a sauce. I used a potato masher to help it break down some more. Removing from the heat, I squeezed the juice of two fresh limes, added a bit of salt and pepper to taste. Then I added some sriracha to taste. I suppose about two tsps or so. Mileage may vary. If you like it hotter, add more. After it cooled, I pureed to a nice, smooth sauce. This is sweet, sour and spicy – perfect for meat, for fried wontons and anything that likes a sweet-sour flavor. It’s good with veggies on rice and just about anything. I mixed the following ingredients together and put them in an airtight storage container. I let the salsa rest for a few hours, allowing the lime juice, onions and chile flavors to soak into the cherries. This made a quart of fresh salsa. Since it is fresh, not cooked, it will need to be consumed relatively quickly, though all the acid will slow spoilage. I served it with a turkey burger for supper and with a bagel for breakfast. I think it would be delicious on grilled chicken breast or pork chops, added to a burrito or on top of a salad. This salad is inspired by Aarti Sequeira’s salad for Food Network, but I have changed it slightly. I cut up 1 watermelon and 1 cantaloupe into 1 inch pieces. As I cut them up, I put them into my giant colander inside a large mixing bowl so that the juice dripped into the bowl. While removing the rind from the watermelon, I set it to one side to use for a watermelon chutney. I left the fruit to drain into the bowl for an hour. Coming back, I poured the melon juice into a glass for a lovely glass of juice. However, I took 2 tbsp of the juice and put it in a small bowl with 1 tbsp of raw buckwheat honey and stirred and stirred and stirred until the honey was blended with the juice. I then juiced two limes into the bowl and 2 generous pinches of sumac. I cleaned and chopped about 1/2 cup of fresh mint and added it to the bowl. I mixed these together and dressed the watermelon. I put it all in a plastic container to marinate a bit. When serving, I just spooned some salad in the bowl and sprinkled feta on top. I do not mix the feta in with the salad until serving because I don’t want it to soften in the dressing. Watermelon is my favorite fruit. I honestly thought nothing could improve on watermelon. 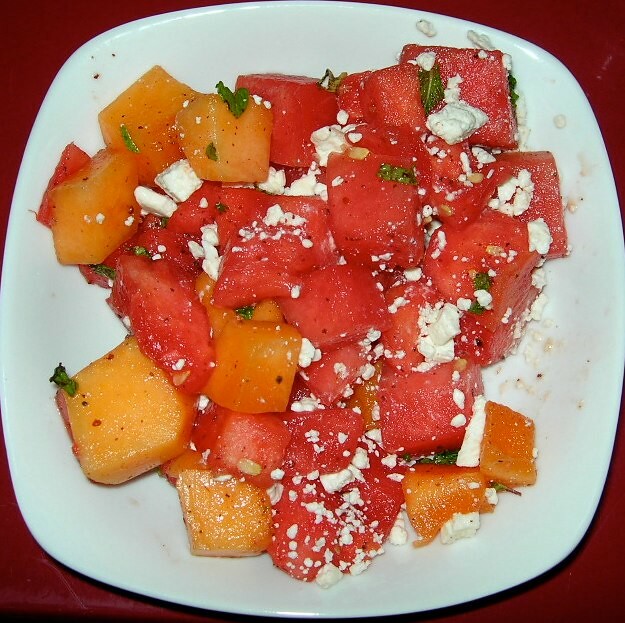 Watermelon is so delicious it hardly needs anything to make it better, but the tartness of the sumac and the bright mint and sour lemon and that hearty buckwheat honey are just amazing together and then the bit of feta. There really can be something better than watermelon.